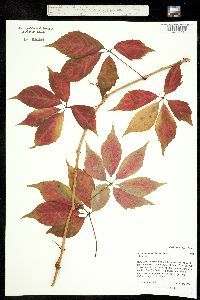 Parthenocissus vitacea has five to seven foliate, palmately divided and coarsely serrate leaves. The tendrils coil to attach to the host plant over which they climb. 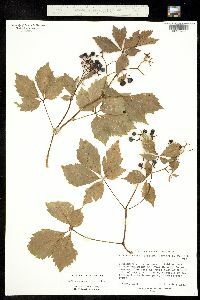 Parthenocissus vitacea is found in canyons along creekbeds at middle elevations. The flowers are greenish white and small in compound cymes. 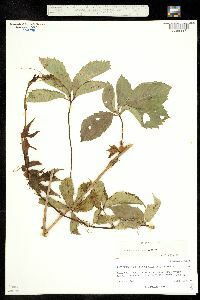 Perennial woody vine to 9.2 m long Stem: spreading rather than high-climbing, reddish to grayish brown, becoming brown to gray, smooth. 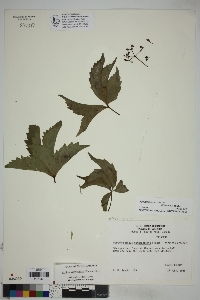 Leaves: alternate, palmately compound with five leaflets and a long grooved stalk. Leaflets are shiny green above, paler beneath, 6.3 - 10 cm long, 3.8 - 6.4 cm wide, egg-shaped to lance-shaped with a pointed tip and wedge-shaped base, coarsely toothed, hairless or slightly hairy along veins beneath. Inflorescence: borne opposite the leaves on current season's growth, forking into two (sometimes three) main branches that continue to fork. Flowers: ten to 60 per inflorescence, yellowish green, with five stamens extending beyond the five reflexed petals. Fruit: a thin-fleshed berry, red-stalked, about 1 cm long, spherical but slightly flattened, with four seeds. 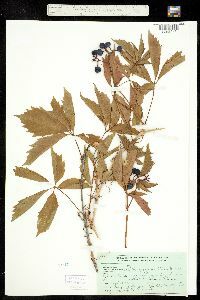 Seeds are light brown, 0.6 cm across and egg-shaped. 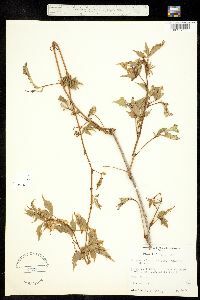 Tendrils: few-branched, usually lacking adhesive disks at the tips. 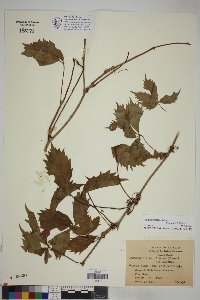 Similar species: Parthenocissus tricuspidata has leaves with either three lobes or three leaflets. 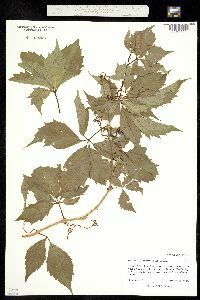 Parthenocissus quinquefolia has tendrils with adhesive disks, an inflorescence with a central axis and grows in more shaded areas. Habitat and ecology: Fairly common in somewhat open areas, where it creeps over small trees, shrubs, and fences or grows along the ground. Notes: Birds eat the fruit of this species, while deer feed on the leaves, stems, and fruit. Honeybees are attracted to the flowers. Etymology: Parthenocissus comes from the Greek words parthenos, meaning virgin, and kissos meaning ivy. Vitacea comes from the Latin word Vitis, meaning vine. Rather frequent in the open throughout the lake area, usually on fences.